President Petro Poroshenko has suggested Ukraine should pass the law providing punishment for denying the Holodomor, the man-made famine in Ukraine in 1932-33. He was speaking on Day of Remembrance of Holodomor Victims in Kyiv. "It is a genocide by all indications as defined in the UN Convention of 9 December 1948. 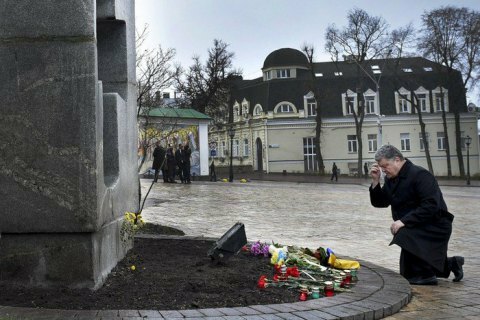 To make it clear for all continents that not recognising the Holodomor is as immoral as denying the Holocaust,” Petro Poroshenko said, adding: “I think it is time for us to pass a law on the responsibility for not recognising these two unprecedentedly horrible tragedies”. "I wish that at least our children witness the incredible. I wish there would be such changes in Russia that will make its new elite also recognize the Holodomor as a genocide. Or at least repent for it. The Russian Federation has voluntarily called itself the successor of the Soviet Union. Hence, whether it wants it or not, it took over not only the assets of the former USSR but also the responsibility for the crimes of the Soviet regime," he said. He added that "nowadays in Russia, there is a restoration of the cult of Stalin, for the first time since the twentieth congress of the CPSU the monuments to one of the bloodiest dictators have been opened, and the famous book series 'Life of Wonderful People' released his biography". "It seems like Stalin will soon be dug out and put near Lenin in mausoleum. Two peas in a pod," he said.